The kill was independently verified by video camera and other data, The Globe and Mail has learned. “Hard data on this. It isn’t an opinion. It isn’t an approximation. There is a second location with eyes on with all the right equipment to capture exactly what the shot was,” another military source said. 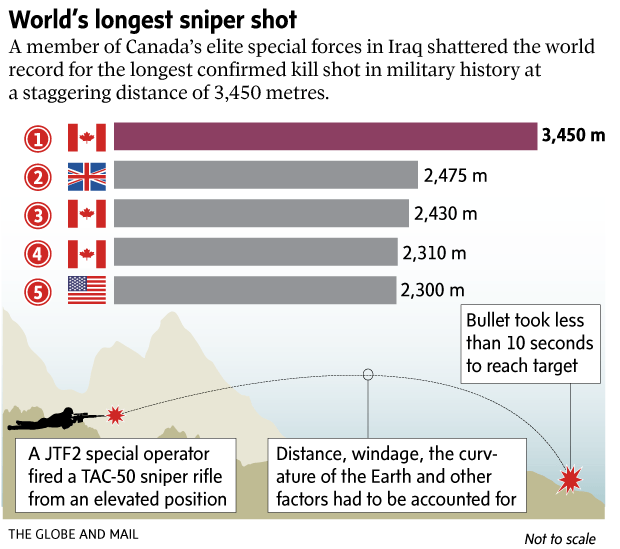 The world record was previously held by British sniper Craig Harrison, who shot a Taliban gunner with a 338 Lapua Magnum rifle from 2,475 metres away in 2009. Previously, Canadian Corporal Rob Furlong had set the world record in 2002 at 2,430 metres when he gunned down an Afghan insurgent carrying an RPK machine gun during Operation Anaconda. Weeks before, Canadian Master Cpl. Arron Perry briefly held the world’s best sniper record after he fatally shot an insurgent at 2,310 metres during the same operation. Both soldiers were members of the 3rd Battalion Princess Patricia’s Canadian Light Infantry. JTF2 special forces are primarily tasked with counterterrorism, sniper operations and hostage rescue. Much of the information about this elite organization is classified and not commented on by the government. The unit’s snipers and members of Canadian Special Operations Regiment, who are carrying out the main task of training Kurdish forces, have been operating in tough conditions in Iraq. The Trudeau government pulled CF-18 fighter jets out of Iraq in 2016 but expanded the military mission, which will see the number of Canadian special forces trainers climb to 207 from 69 in an assist, train and advise mission. Canadian commandos are not supposed to be involved in direct combat, but are authorized to go up to the front lines on training missions with Kurdish Peshmerga fighters and to paint targets for coalition air strikes. For operational security reasons, sources would not reveal the names of the elite Canadian sniper and his partner, nor the location where the action took place. A sniper and his observer partner are often sent to remote and dangerous locations to hunt down insurgents while having to carry heavy equipment. Once they have located the target, snipers follow the same methodical approach before each shot. 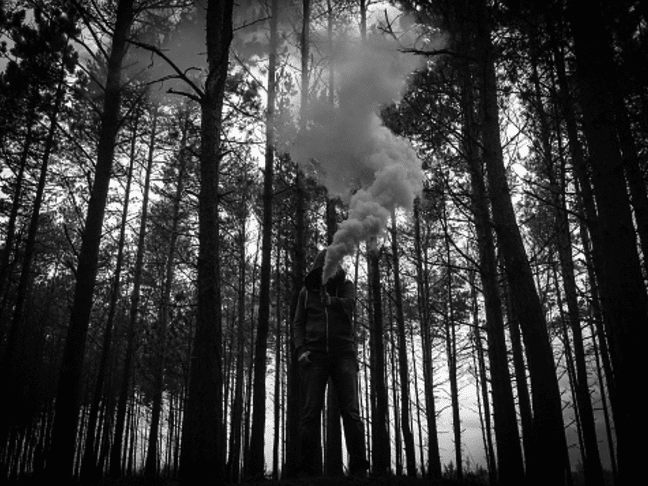 Breathe in, out, in, out, find a natural pause and then squeeze the trigger. 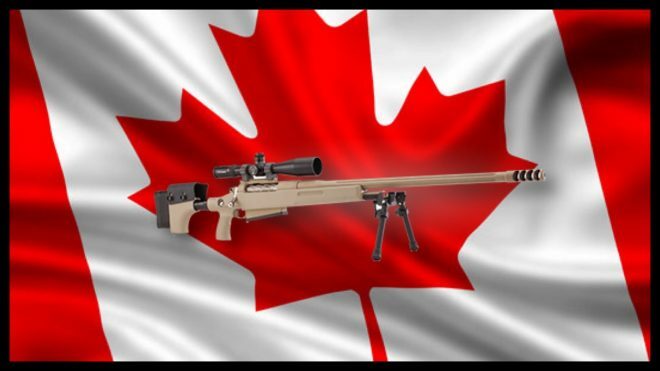 Canada has a reputation among Western military forces for the quality of its snipers, despite the small size of the Canadian Armed Forces compared to the United States and Britain. The skill of the JTF2 sniper in taking down an insurgent at 3,450 metres required math skills, great eyesight, precision of ammunition and firearms, and superb training. U.S. Sergeant Bryan Kremer has the longest confirmed sniper kill shot by a U.S. soldier. He killed an Iraqi insurgent with his Barrett M82A1 rifle at 2,300 metres in 2004. Traditionally, I give the Canucks a lot of grief in GiA. However, on this one, I salute them. So this last weekend – mid Ramadan (but the UK authorities are adamant that has nothing to do with it) – yet another series of well coordinated attacks in London. The timing was on cue, and the technology was primitive, yet the effect was successful. The weapons were simple: Aggression, Motor Vehicles, and Knives. Unless the nanny-state wishes to now castrate the aggression out of all males, prohibit all sharp instruments in an Okinawan-like decree, and force everyone to use public transportation, the ability of the state to prevent the next one is ridiculously impossible as long as the culture that advocates such things is allowed to roam free in the west. That last bit is out of the hands of normal people like us, yet we are the ones that will stand at the front line of the effects of the political decisions made by those in charge. And we will either stand as ready sacrifices to the death cult, or as combatants. Britain seems to have already chosen out of their self-imposed helplessness. Soon the west, and Europe in particular, will either find its warrior heart and embrace the old ways, or it will be bent over the table and given its fate. Do not think for one minute that your secret Jujitsu or Kung Fu methods will guarantee you winning against a dedicated, motivated, young and fit jihadist armed with a big knife intent on killing you. Add to that his expectation of dying that day…add to that his accomplices, also armed with knives, and you get a clearer picture. And winning does not mean 7 out of 10 in the drills at the dojo…it means we want a solid chance at a 100% success rate because anything less means that you die. Your chances may be better if you have devoted your entire life to nothing but full contact martial arts training (and if your adversaries are unskilled)…but otherwise…unarmed against the knife is a very foolish match to go into. Yes, I know…it may mean violating the rules. As I have said…and it is almost a cliche now…we live in a time of war and we must make adjustments to the reality and accept that the authorities cannot prevent these events from taking place. So if you live in a free state, carry a firearm with you – EVERYWHERE. Ignore the sign if there is one saying you cannot. If you live in a not so free state, carry a firearm with you anyway and always obey the speed limit. If you live in a country intentionally bereft of any warrior culture, see item three. “But Gabe…we live in (insert oppressed socialist state or nation here) and we can’t even buy a picture of a gun here”. A modern, educated man with a set of nuts in his bag will always figure out a way to be armed. No guns? OK, get your own knife. Knife versus knife is a far better proposition than unarmed versus knife is it not? My God, at the very least get a big fat stick that you can claim is a cane and that you can crush skulls with. It really is not that difficult if there is courage, and a will, and a defiant heart that denies the state’s right to control your destiny. “But Gabe, the rules say I cannot have guns, knives, sticks, anything that could possibly be used as a weapon and they are about to pass laws banning ill will”. When you cannot live in safety, and in obedience to the established law, a learned man will happily become a scofflaw. If you disagree with that, I really have nothing for you. Sorry…good luck. This is why I am not impressed with the majority of martial arts training. Too much sport. Too much esoteric spiritual stuff. Not enough violence. We need more “martial”, and less “art” – as it were. I expect that today, the Monday after the London Bridge attack, the martial arts schools in the UK (and USA) will be filled with eager soccer moms and football dads (cricket-moms and rugby-dads?) looking for the easy solution to this problem. And they will be taught esoteric stuff intended for the “perfection of character”, or stuff developed for winning a match somewhere. What they need is to be taught to physically destroy their opponent, crushing windpipes, smashing skulls, breaking bones. The “real karate” that so few schools even understand much less teach. But again, see item 1. I have trained in hand to hand stuff since I was ten years old and I would prefer to not face against a knife empty handed. It is 2017. Are we already forgetting that there is a true social-religious-political culture living in the west…in truth invited by the west, that seeks to supplant western culture by force and attrition with its own culture? 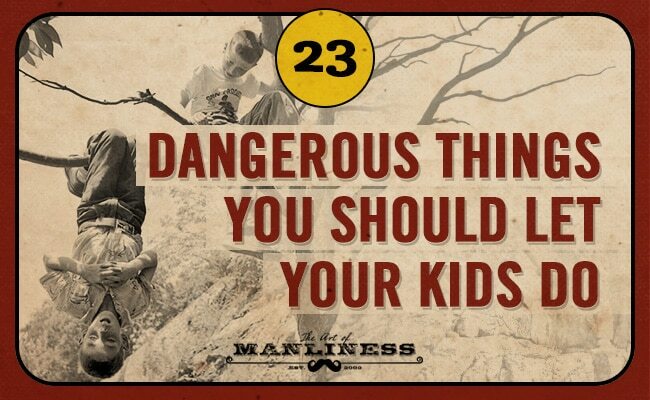 If you see a couple of strong young men, that look like they just got off the boat from Afghanistan moving aggressively toward you with knives in their hands – do we really need to have a time out to explain what their intentions are for you? This is the time to draw and shoot each one of them to the ground, not running or hiding. All the weapons and willingness to violence will not help you in the least if you are asleep at the bar. The first part of all this is staying alert. Sit where you can see the exit, have your back covered or have an equally alert associate watching it. Look around constantly and know who is moving and what is happening. Don’t want to live like that you say? Well, western nations, you should have thought about that before you invited the death cult into your country, or voted for fools that did so. You live in a time of war and you will either deny it and hope you are not selected by the next jihadist, or you accept reality and prepare to meet him. That is all. There are no secret techniques to defend against the knife by physically frail and empty handed males. It takes violence and weapons. And in that order. I don’t have to know someone’s ethnicity or religion. If they approach me menacingly with a blade, that’s it! In win for Asian-American rock band the Slants, and possible boost for the Washington Redskins, Supreme Court rules that the government can’t refuse to register trademarks that are considered offensive. AGAIN, free speech is not about that with which we agree!